Key facts: this certified organic wine, pasta, and tomato estate is a great place to discover the character of Nero d’Troia. Method of fermentation: Crushing and soft rasping of whole grapes. Temperature-controlled nine day fermentation using the delestage method. Aged in stainless-steel and in bottle one year. Method of fermentation: Sangiovese harvested mid- september, Montepulciano harvested in early october. Crushing and soft rasping of whole grapes, temperature controlled nine day fermentation using the delestage method. Aged in wood and steel, in the bottle for six months. Method of fermentation: harvested starting in mid-September. Fermented in stainless steel for a week, with regular pump-overs. Lightly filtered. Method of fermentation: Crushing and soft rasping followed by 24℃ fermentation, maceration in 10 hectoliters wooden barrels with manual punching for 11 days. Malolactic fermentation in wood. Aged one year in untoasted french oak barrels and one year in stainless-steel. Method of fermentation: Wild yeast fermentation in troncais barrels. Maloactic fermentation in wood and aged in untoasted french oak barrels. Unfiltered and in bottle for a year before release. Paolo is a learned man immersed in his country’s history and literature. He isn’t stiff: he’s an intellectual that’s also fun to be around. He is soft-spoken, perceptive, and kind. Paolo’s many interests make him great company for sharing a meal and a bottle of wine. We are on the same wavelength regarding the role of food and wine in our lives, and the ethics of their production. La Motticella is the manifestation of this philosophy. It was windy and cold outside. Friendly dogs followed us as Signore Petrilli spoke of the history of his farm and the surrounding territory. It’s a common story in the south, three families controlled virtually the entire area nearby, roughly south of Monte Gargano. Development of a modern natural farming community in the area was slowed by this history and the less-than-ideal distribution of land that followed the dissolution of feudal agricultural patterns. The land is not dramatic, but it is pretty, gently sloping, a low rise covered with vines, surrounded by excellent tomato territory. Paolo Petrilli farms and bottles some of the best, most coveted organic tomatoes in Italy. They are in very short supply. We will have to settle for importing them a jar or two at a time. I’m vocal about wanting more. He works 11ha of vines, all planted on stony soil in 1998 and 2002. La Motticella was one of the first certified organic estates in southern Italy. All the fruit is estate grown and bottled, a key component of keeping the standards high. “If we don’t get good quality, we don’t produce. Petrilli said.” They skipped 2004, for example, because of botrytis. “I don’t have international varieties.” Fine by us. This farm is dedicated to the best flavors of northern Puglia. Nero di Troia, Sangiovese, Montepulciano, Aglianico. “Nero di Troia is a very rough grape, hard to tame,” Petrilli said. “Most of the soil around here is very good, strong, fertile soil. My vineyard has stones.” That rocky material is necessary for tempering the vigor of vines and yielding a wine worth finding. Paolo makes 25,000 bottles of wine per year, from a small hill at the top of his farm surrounded by fields of local tomato varieties. They harvest by hand. The wines spend time in troncais barrels. Fortuita IGT Daunia is not as concentrated as Paolo’s more expensive reds. It has a nice freshness, the result of a windy, dry vintage. Paolo’s “daily” wine is stellar, a combination of Montepulciano, Sangiovese, Aglianico and Nero di Troia that was a standout match with lunch at the farm, really stellar with pasta featuring Paolo’s tomatoes. 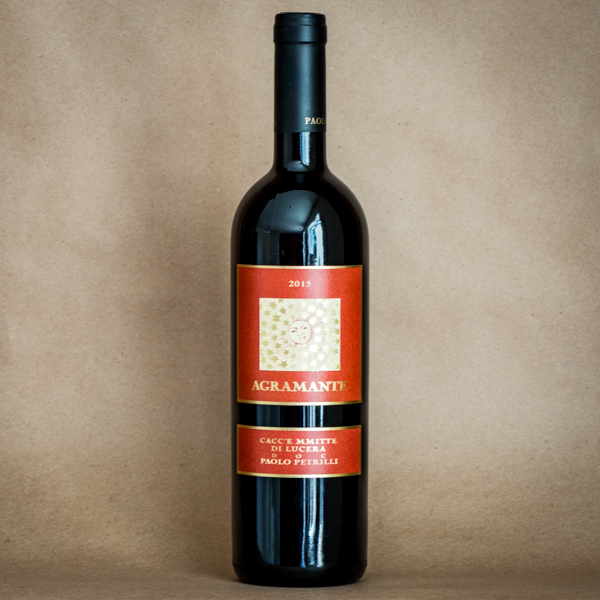 Agramante is mostly Nero di Troia, with some Montepulciano and Sangiovese. “This was once the wine of the poor man: you had to make it fast.” Agramonte is vinifed in stainless steel and then aged in wood. “When we started this was a simple, cheap product. I decided to aim for something greater.” This is the calling card of La Motticella for me, the one that resonates as most complete. It is also the most balanced wine I have tasted from Puglia. It was really encouraging to encounter this amazing, ideal southern wine. Il Guerro is the wine that makes Paolo’s thoughts turn to youthful strength, to hunting boar in particular. My first encounter left me a little intimidated, it’s a wine of density, intensity. But I also made fervent notes to buy some, to try it more. It may be the wine that sleeps in our cellars for years, then emerges to blow our minds. As we amble through a tasting of Paolo’s riservas our conversation turns to Italian literature and my notes fall apart. The wines in this line function perfectly, they are world-class and flawless. They also push your mind toward life’s other innately great creative things. So we talk of Zeno’s Conscience, Il Gattopardo… the dining room is wonderfully classical yet relaxed. There’s something about a wall of bookcases full of clearly well-loved volumes that sets the stage for real conversation. The Petrilli family are charming. Paolo’s mother is lively and opinionated, still the matriarch, sharp and perceptive. His wife shares Paolo’s generosity and patience (with tardy Americans!) and effortlessly rolls out a simple but nuanced Puglian feast. Paolo’s daughter is an island of calm and intelligence throughout our raucous lunch and wine tasting, a great guide for my reeling mind as I clearly lost my bearings among the multiple crosscurrents of conversation intersecting the table. Paolo’s son is irrepressible, full of life and energy and good humor. Tall, strong, maybe the backbone of a bright future at the estate? I loved the wines, and loved my brief visit. If only this standard of quality was the regional norm, instead of a benchmark. But all communities need leaders, visionaries, and Signore Petrilli has all of the gifts and elements of character to be a transformative figure for Foggia. Well, that was exhausting. I left La Motticella in a super mood, heady, happy, certain we’ve found our man. Paolo Petrilli visit September 2018. Tomatoes! There is a barn on the side of the driveway leading to Paolo Petrilli’s house. Inside a dozen Puglian women and half a dozen men, dressed in red shirts, white pants and white aprons, white Wellington boots, gloves, hairnets and hats, are preparing jars of tomatoes. The building is the size of a small winery, and in fact shares similar equipment to a cellar (stainless steel tanks, for example.) It is adjacent to the buildings where Petrilli makes wine from Nero di Troia, Aglianico, Sangiovese, and Montepulciano. There are crates of fresh basil, colanders filled with peeled tiny Corbara tomatoes (like a cherry.) Tomatoes still wearing dirt from the Petrilli’s fields are delivered by a tractor one trailer-load at a time and brought inside, smaller ones collected in the cassette scrupulous Italian farmers use to pick grapes in 20kg increments, larger tennis ball-sized tomatoes delivered in pallet-sized plastic baskets. They are washed in colanders and soaked in blue plastic tubs that look like laundry baskets. Brilliant orange-red at this stage, they look otherworldly and delicious, a perfect encapsulation of southern abundance and fertility. After blanching, the tomatoes are quickly peeled on large stainless steel tables by a team of women, and then deposited by the handful into quart jars, each containing a sprig of bright green basil. This is work and it requires effort and concentration, quiet counting as the little tomatoes are distributed, but there are smiles and quiet conversations in the room. Fans whirl overhead. There is the sound of steam and small machinery stirring liquid. Paolo stands in the doorway, talking to a foreman or field worker. On a small conveyer belt less than a dozen jars at a time move toward their final closure. Puree is poured in, green tops affixed. They wait on pallets for labeling. Inside Petrilli’s home we are served a simple and delicious lunch of mezzi paccheri and diced tomatoes, topped with a sprig of basil. The sauce has essential goodness. It tastes clean, healthy, unfettered. We are alone with Paolo, but his family’s influence is here. The farm has become vegan after Petrilli’s young daughter converted to that philosophy. Paolo splits his time between Rome and his family’s ancestral farm. He says he prefers the country, but life in the city has considerable benefits for his children. Outside in Paolo’s courtyard thirsty muddy hairy large dogs drink from a giant old stone trough. We’ve walked through fields to see Nero di Troia and Aglianico grapes essentially ready-to-harvest. Today all produce of the farm is certified organic, but it was not always this way, and the change was a decision Paolo’s father could not necessarily embrace. The farm was completely destroyed in the war. Everything was rebuilt over the course of 20 years. Paolo Petrilli’s farm is on our way out of Puglia. Or the way in I suppose. On this visit we are moving north and west, away from beaches and farms and stone medieval towns of Puglia’s eastern and southern coast. This farm feels a world away, technically Puglia but to my internal geography a transition zone more blatantly agricultural and tethered to the larger Italian peninsula above it. After saying goodbye to Paolo we drove directly to Gragnano, a teeming layer cake of hillside neighborhoods that rises from the sea directly south of Naples. I wanted to visit Gragnano to learn about the barely fizzy ink-black low alcohol red the area makes. That plan was scuttled by coincidence. Paolo Petrilli’s pasta making facility is a few short blocks from the ridiculous hotel where we were booked for the evening, a riot of giant urns, tropical foliage, marble, and alarming cleaning product smells. There was a big wedding happening. Silver suits, abundant balloons, cute child ushers. Vesuvius hides in a massive white cloud in front of our lemon tree-lined patio. Out on the street Vespas darted in every direction, sidewalk and roadway merged, traffic mostly crawled past piles of stores and teeming conversing locals. So much energy, peeling paint, unevenness. With remarkably little trouble given the density of life here, we find l’oro di Gragnano, a little ground floor pastificio artigianale under a residential apartment building, across from an urban soccer field and church schoolyard. Inside it is tiny, the main room mostly filled by one large piece of pasta making equipment, a rack of heavy bronze dies, a small hot pasta drying room filled with pasta on wooden racks. There are two workers when we arrive. Soon after the couple who own l’oro di Gragnano make an appearance with their child, presumably notified of our intention to barge into the operation by Paolo. There is obvious pride in the realness of the work here, striving for optimal quality through simple correct work on a human scale. We leave overladen by generosity, and pasta. As inspiring as our visit is, this night in Napoli is for pizza. Farmer Abundance! 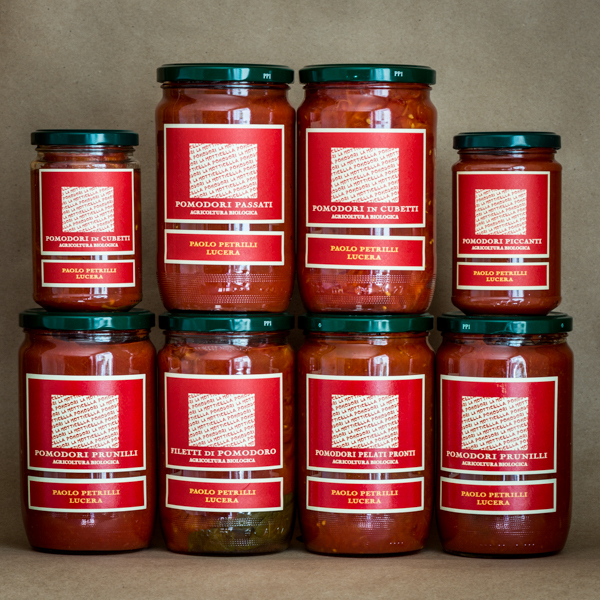 These food products from Paolo Petrilli are currently available in North Carolina.